Isn't it just about time for Apple to come clean that not only is the iPhone 5 on its way, but that it will also be landing at Sprint? For those of you unfamiliar with what a blackout period is, it means that no one is allowed to request time off between those dates. 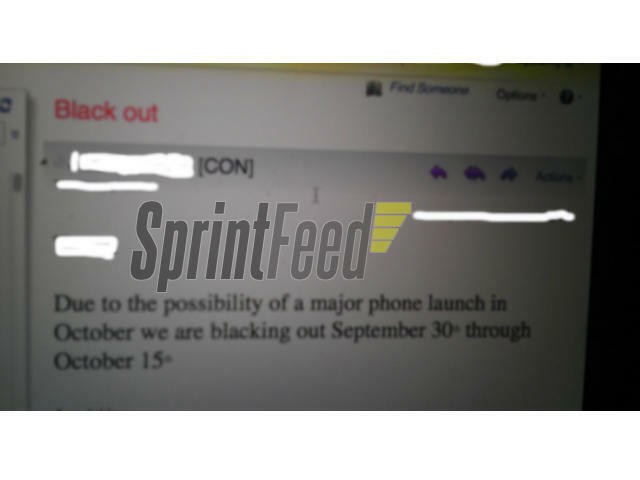 Since there are no known major phones coming to Sprint during that time, and it isn't close to the holiday season, it certainly raises some questions as to why the carrier wouldn't want anyone taking time off during that period. The time frame fits in very nicely with the rumored launch dates of the new iPhone, but that of course still doesn't necessarily prove anything, it just makes you go "hmmm." It's looking more and more likely that the next few weeks are going to be prove to be very exciting in the land of phones, stay tuned to TechnoBuffalo to learn what exactly is about to happen.